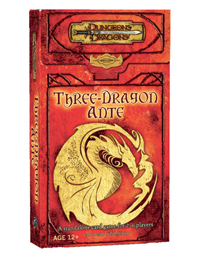 The Return of Three-Dragon Ante! I've kept quiet for months, but the hatchling is out of the nest! The photo below is from W. Eric Martin's Board Game Geek report on this year's New York Toy Fair. 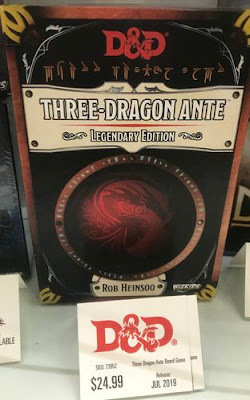 WizKids will be releasing Three-Dragon Ante: Legendary Edition later this year. I'm overjoyed to have the game coming back to print and I think both long-time players and newcomers will find something to like in this edition. 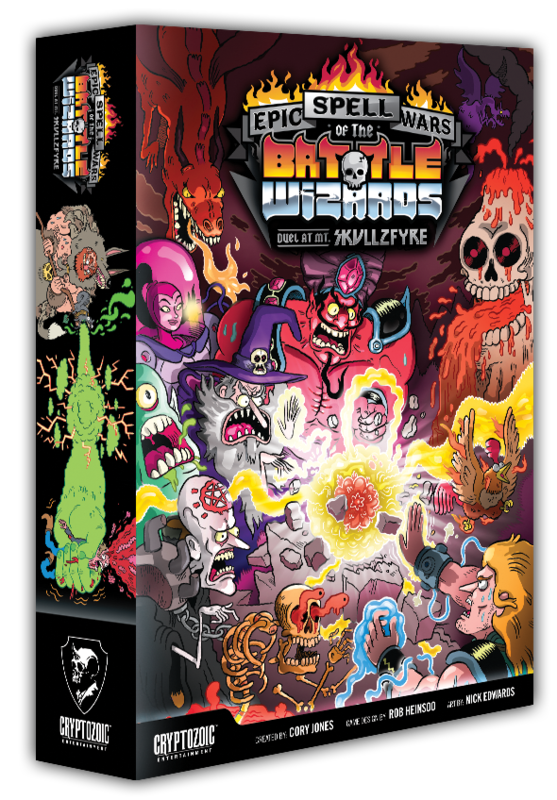 I apologize for announcing the upcoming game without explaining more about its contents and intentions, but WizKids hasn't made the detailed product announcement yet. If you're not familiar with Three-Dragon Ante, it's a card game of luck and skill that I designed to be something like Hearts in terms of complexity and playtime, though not in technique. In some respects, 3DA is the opposite of poker, since instead of folding out of hands, savvy players milk their cards for as many micro-rewards as possible, setting up later success. As an in-world game based on the iconic chromatic and metallic dragons, it's what heroes and other tavern-goers play for gold in the worlds of D&D, and you'll find it referenced a few places in the D&D Players Handbook. We've played soccer together for 33 years and card games for 30, so really, I should have known that Lisa's favorite card art wasn't going to be something subtle! Her favorite Wrestlenomicon move is Squishyface, a Combo for Hastur that will enter the deck when we hit our first stretch goal and expand to 70 card decks. Back the Kickstarter! Summon the Squishyface! Arc Dream has announced our targets for adding new elder gods to the Wrestlenomicon Kickstarter! Actually Arc Dream announced a whole bunch of new stuff, including playmats, wallpapers and even a special card illustrated by John Kovalic! Perhaps the biggest piece of the announcement is the plan for adding new elder god decks to the game. Cthulhu & Hastur made sense as the first to engage, but what's a cosmic battle between elder gods without the Crawling Chaos? The new gods will also come with rules for three and four player games. 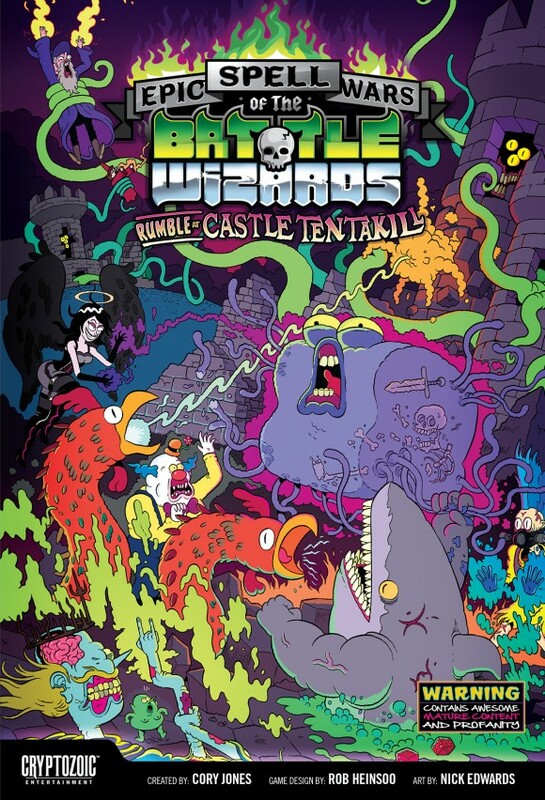 Battle Royale is grand melee style, every god for itself, or fight as a team. If fighting as a team feels too goody-two-shoes for you, there is of course an option for fighting each other after you've wiped out your rivals. I've already designed the first draft of the Nyarlathotep deck. 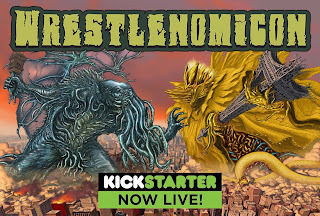 Same system that we used for Hastur and Cthulhu: Dennis and Shane supplied the names and I'm coming up with mechanics, though obviously we need the Kickstarter to fund and push through to the stretch goals before Kurt handles the art. Yog-Sothoth isn't as far along as Nyarlathotep but the first draft is in progress. Here's how I summarize the new-elder gods. Nyarlathotep messes with opponents by using Mastery cards that slam their own type of attack as well as their usual target. For example, Nyarlathotep's Bizarre Mastery card, Nyarly Don't Surf, slams Bizarre as well as Dominance. And while Nyarly's attacks and permanents slow the enemy down, Nyarly is busy building a pyramid of cards! Each attack that hits Ground Zero adds another block to Nyarly's pyramid. Cap the pyramid off, power Nyarly up, and your enemy is gonna get capped. Yog-Sothoth plays from two angles with twister cards that can use their Momentum to move its cards backwards on the track, looping all the way around to the lowest spaces near Ground Zero. Meanwhile, Yog-Sothoth has 'Groove Thang' cards (like When a Singularity & Matter Love Each Other Very Much, or Let's Smoke a Bowl of Antimatter) that mess with the enemy all the way down the track. Groove Thang cards generate random aggressions that are printed on Yog-Sothoth's Cultist cards. Trigger a Groove thang ability higher up the track (not at Ground Zero), draw a random YS Cultist, and find out what grooved. 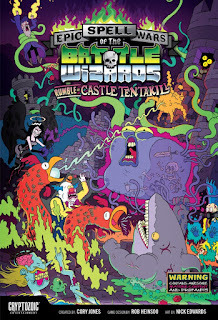 Wrestlenomicon vs. Epic Spell Wars ! ! ! That's pro-wrestling-style hype for a grudge match that's more likely to be a team-up! Three of the card games I’ve designed are somewhat similar to Wrestlenomicon’s style, play time, or ambition. Here are notes on fun elements of Three-Dragon Ante, Inn-Fighting, and Epic Spell Wars and how those elements compare to what’s going on in Wrestlenomicon. 3DA is a game world artifact, the card game people in D&D worlds entertain themselves with in taverns when they’re not brawling. 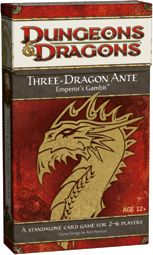 Ambition: Like Wrestlenomicon, Three-Dragon Ante features a simple mechanical innovation I was surprised hadn’t been used before. In 3DA’s case, that’s the idea that high cards help you win the stakes but cards lower than what your opponent just played provide micro-rewards that set you up for later success. That makes Three-Dragon Ante the deliberate opposite of poker, that rewards folding out of bad hands instead playing through. Wrestlenomicon’s ambitious streak, mechanically speaking, is that it models big slow cosmic wrestling attacks by giving them no immediate effect when played, except for moving a previously played attack (or attacks) further down the track towards Ground Zero, where attacks go off. This style of obvious-incoming-attack and uncertain-momentum seems to me to do a pretty good job of modeling a wrestling match, and I was amused to come up with a fun mechanic that apparently hasn’t been used before. A card and dice game of tavern-brawling. Play-style: This one is a bit more like Wrestlenomicon in that it’s definitely a fight that rewards offense more than defense. There’s a lot more uncertainty about what you’ll be able to accomplish on your turn—dice are like that. So it’s much less strategic than Wrestlenomicon. Inn-Fighting is also a game that is meant for multiple players, not a great two-player experience. In that, Wrestlenomicon is different than all three of these games. Wrestlenomicon was designed as a two-player game. Even if we don’t do more decks right away, you’ll be able to play good three or four player games as grand melees or team matches if you have more than one copy of the game. If the Kickstarter does well and we publish more decks soon, even better. ESW is definitely the closest of my little card games to Wrestlenomicon, if only because it benefits so hugely from co-creators card concepts and sense of humor! I submitted a game of dueling wizards to Cryptozoic. But by the time ESW was published Cory Jones had changed nearly every name and written an entirely new art order. So the punch-drunk names and wild art by Nick Edwards in ESW, that add so much to the game, well, they weren’t how I’d handled it. Likewise, in Wrestlenomicon, Shane Ivey and Dennis Detwiller came up with all the card names. They’d handled the art direction and Kurt Komoda handled the art before I joined the team. So instead of the ESW situation, where I actually had no idea what cards were going to accomplish by looking at the final art, since everything had gotten moved around, with Wrestlenomicon I got to design every element of the mechanics to match and live up to the art. I’d say it was inspirational but it went a couple steps past inspiration. I scrapped the first two attempts because I needed to create a game that was enough visceral fun to live up to Cassilda’s Thong and Tentacle Necktie! I’d say that ESW and Wrestlenomicon end up as similar crazy-fighting fun. ESW is lighter, but as a two-player game, Wrestlenomicon is faster. You can usually play a full two player Wrestlenomicon game in between twenty and thirty-five minutes, sometimes even less. Longer games are possible, but rare. Even so, the decisions you’ll make each Wrestlenomicon turn, and over the two or three turns you might be trying to look at least half-way ahead, are more decisive. Play skill matters more in Wrestlenomicon, despite the apparent randomness of the dice. It’s possible for one game to pivot mostly on the dice, but if you play two or three games, patterns emerge. If you’re curious to see more of how Wrestlenomicon plays, click here for a how to play video from Bebo with bonus wrestling violence, and then check out the full rules and initial DIY card set that are available in the first update for Kickstarter backers. Any pledge will get you through the gate to see the DIY kit. If you’ve read this far, chances are that you’ll like it. Hastur vs. Cthulhu: The Home Front! 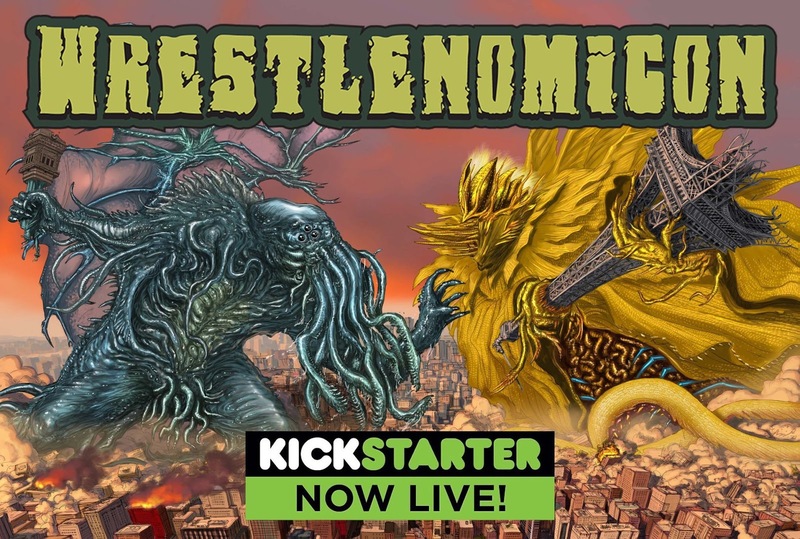 The Wrestlenomicon Kickstarter is in full swing with rules and DIY printable PDFs available in the first update for backers! The campaign is structured so that most pledges add to either Cthulhu's coterie or Hastur's entourage. You'll find that Cthulhu is accepting allegiance on Twitter at @TentacleNecktie, with Hastur slightly in the lead at the moment at @EatYellowSign! This Cthulhu vs. Hastur grudgematch has been playing out in my house for a couple years now, because my wife Lisa . . .
c) loves the art on the Hastur cards so much that she has a hard time playing Cthulhu, even though the straightforward Cthulhu mechanics are more her personal style. She plays Red/Black in M:tG, and Hastur is a bit more Blue/Black if we're gonna break it down like that. Lisa's Sense-of-Hastur helped keep the design on track when things got a bit too convoluted. So Kurt Komoda's amazing Hastur art easily claimed its first victim. Lisa had never heard of the Yellow Sign, but she's an artist and a writer and Hastur had her number from the first stroke of its giant paintbrush. Me, I can't choose a side. I love all our children equally. If pressed, however, I'll admit that little Nyarly, waiting somewhere in the shadows, that kid has issues. Cthulhu. Hastur. Who’s the Great Old One, and Who’s the GREATEST Old One? Strategy, luck, and even more chaos is coming up in the next installment of the series. Apocalypse Road mixes car wars-style combat in with the racing. I always wanted to like SJG's Car Wars, but the truth is that it was too fiddly for its payoff, for me, so I'm looking forward to auto-combat in a system I enjoy. At some point I decided to sponsor a driver in the game, paying a bit of support money and naming him Ole Tubli. Like my name, it ain't pronounced like you'd expect, which is fine. If you're not pronouncing it American style, this driver's name is Estonian for 'fare forward bravely,' my Dad's usual telephone sign-off, pronounced o-lay tube-lee. After getting Ole Tubli into the races, I realized this was probably my life's one chance to sponsor a racing team. So Ole Tubli is part of the Archmage Engines team. 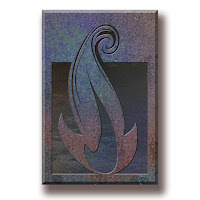 Yes, the team will use something like the symbol of the Archmage from 13th Age, though I haven't worked out with Jeff which image will work better for his game. Maybe something like this . . .
Or if we play it straight . 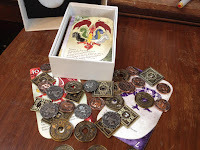 . .
Jeff has written a series of blog posts introducing the Apocalypse Road racing teams and the post involving the Archmage Engines just went up. If you feel like racing alongside Ole Tubli (plays mean guitar), Gid Zornes (grinder), and Sargon "The Winged Bull" Ashur (master metalworker) by sponsoring/naming a driver on the (extremely eclectic) Archmage Engines team, Jeff's blog has notes on how to join! As the blog mentions, the game has reached the magic 500 pre-orders threshold, so GMT is going to start production and publish. The game is still available for the lower pre-order price through its GMT Project 500 page.